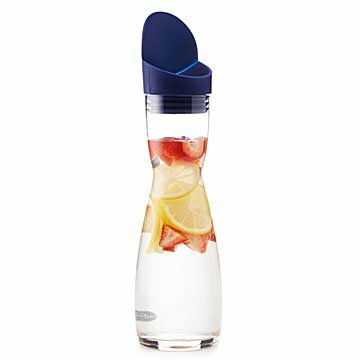 Keep water infusions like fruit and ice where they belong with this clever design. Fresh fruit, herbs, and ice—all things that make water tastier, but bona fide splash hazards when they escape your bottle. This clever carafe offers a solution: The built-in strainer keeps those add-ons in place, while the flexible silicone lid flips open with just a push on its back. The hourglass shape offers a natural handhold along with a contemporary profile. Made in China. Hand wash silicone flip top. Carafe is top rack dishwasher safe.